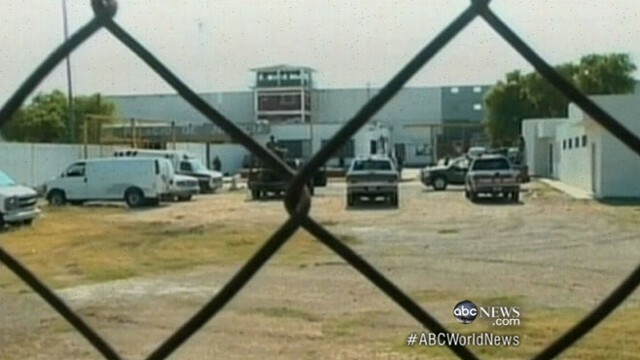 WATCH Mexican Prison Break: Fugitives in Texas? Authorities have launched a massive manhunt for more than 130 inmates who made a daring daylight escape from a Mexican prison using a tunnel equipped with ropes and electric cables. More than half of those who escaped from the prison in Piedras Negras, just across the border from Eagle Rock Texas, were serving time for federal crimes, including drug trafficking. Though drug gangs are often tied to prison escapes in Mexico, authorities have not yet linked the escape to a specific gang. The attorney general of Coahuila state, Homero Ramos Gloria, said that three employees of the prison, including the director, were being questioned about the potential involvement of staff in the mass break-out. According to Mexican media reports, a dozen guards were also detained. Ramos told a Mexican television station that the 21-foot-long tunnel, which was four feet in diameter , "was not made today. It had been there for months." Ropes and electric cables were also found nearby. "We have 132 inmates escaping through a tunnel," said Ramos, "and it doesn't make sense." The number has also been reported as 129 and 134 in the Mexican press. According to Mexican media reports, the escape occurred just after 2 p.m. Monday and took 15 minutes. The inmates overpowered guards in the prison's watchtowers, escaped through the tunnel and cut through a chain link fence into a vacant lot. No alert was sounded until an hour after the inmates, who represented a fifth of the prison's total population, had escaped. More than 5,000 police and soldiers are now searching for the escapees. In an emailed statement, U.S. Customs and Border Protection said it had been made aware of the escape and was in touch with Mexican officials. "CBP is aware of the reported jail break in Northern Mexico, and out of an abundance of caution, has placed its officers and agents in the Eagle Pass, Texas area on alert," said spokesman Dennis Smith. "At this point, CBP has no reports of escapees attempting to cross the border." "We remain in communication with our law enforcement partners in Mexico and maintain a shared interest in keeping our mutual border secure," said Smith. In 2010, more than 150 inmates broke out of a prison in Nuevo Laredo, across the Rio Grande from Laredo, Texas. Forty-one guards were charged with aiding in that escape, the largest in Mexico in recent years. During a 2009 escape at a prison in Zacatecas, 30 men dressed as federal police officers raided the prison and liberated more than 50 members of the Zetas drug gang.